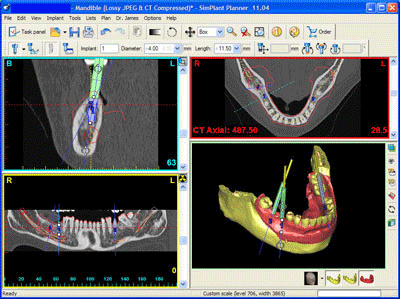 In complex implant cases, Dr. Wilson utilizes special computer software to provide comprehensive information about his patient's oral anatomy and the detailed blueprint of his planned implant procedures. 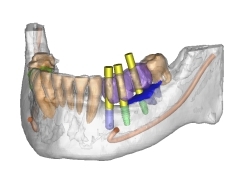 Simplant is proprietary dental software that imports the images from the I-cat three-dimensional scan and reconstructs it in a manner that allows Dr. Wilson to select and place dental implants in an ideal position utilizing a "virtual surgery". In some cases Dr. Wilson will perform the virtual surgery and take the information he has learned to the mouth to be utilized during your actual surgery. When additional precision is necessary, the Simplant plan can be uploaded over the Internet and used to fashion custom-made surgical drill guides to ensure that the dental implants are placed in the positions planned during the virtual surgery. 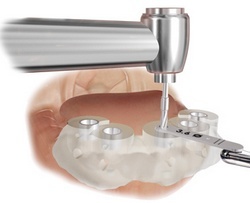 The surgery is completed with better safety and predictability.